Cabinets don’t last forever, and the ones in your kitchen may just not be what they used to be anymore. Giving your kitchen or bathroom cabinets a facelift will not only improve their aesthetics, but it will also make the room much more functional and provide you with organized storage space. 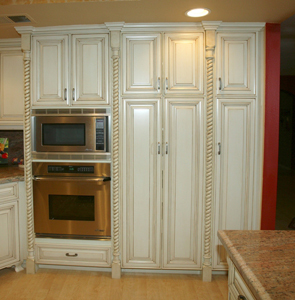 When you need a cabinet maker and remodeler you can trust, look no further than Reborn Cabinets. We are a premier cabinet maker and remodeling firm in Southern California, and we can transform your kitchen, bathroom, or any other room in your home into the orderly and attractive space you’ve been longing for. Though cabinets are our specialty, we are much more than just a cabinet maker. We are also a full-service remodeling contractor, licensed, bonded, and insured in the state of California. We can provide you with a new kitchen design and complete that bathroom remodeling project you’ve been dreaming about while providing you with The Ultimate Remodeling Experience®. Once your project is underway, you will be working with Team Reborn, and we like to think of you as the team’s most important member. We will keep you informed on all aspects of your remodeling project, and keep your opinions, wants, and needs at the center of the process. If you know Reborn Cabinets is the cabinet maker for you, or if you would like to find out more about our cabinets and cabinet refacing, contact us at 1-877-371-4943 or stop by our 40,000-square-foot manufacturing facility and showroom in Anaheim today. We are proud to be a cabinet maker serving Orange County, Laguna Niguel, Placentia, Yorba Linda, Brea, Santa Ana, Fountain Valley, Mission Viejo, Huntington Beach, and other nearby communities.